ITP is a primary illness occurring in an otherwise healthy person. Signs of chronic disease, infection, wasting, or poor nutrition indicate that the patient has another illness. Splenomegaly excludes the diagnosis of ITP. Many children with acute ITP have an increased number of normal or atypical lymphocytes on the peripheral smear, reflecting a recent viral illness. 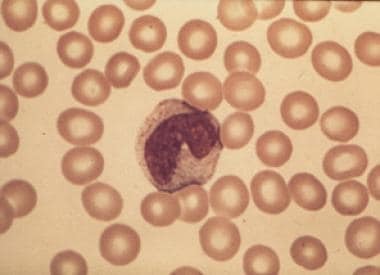 Clumps of platelets on a peripheral smear prepared from ethylenediaminetetraacetic acid (EDTA)–anticoagulated blood are evidence of pseudothrombocytopenia. This diagnosis is established if the platelet count is normal when repeated on a sample from heparin-anticoagulated or citrate-anticoagulated blood. Immune thrombocytopenic purpura (ITP)—also known as idiopathic thrombocytopenic purpura and, more recently, as immune thrombocytopenia—is a clinical syndrome in which a decreased number of circulating platelets (thrombocytopenia) manifests as a bleeding tendency, easy bruising (purpura), or extravasation of blood from capillaries into skin and mucous membranes (petechiae). In persons with ITP, platelets are coated with autoantibodies to platelet membrane antigens, resulting in splenic sequestration and phagocytosis by mononuclear macrophages. The resulting shortened life span of platelets in the circulation, together with incomplete compensation by increased platelet production by bone marrow megakaryocytes, results in a decreased platelet count. No single laboratory result or clinical finding establishes a diagnosis of ITP; it is a diagnosis of exclusion. The differential diagnosis includes such other causes of thrombocytopenia as leukemia, myelophthisic marrow infiltration, myelodysplasia, aplastic anemia, and adverse drug reactions. Pseudothrombocytopenia due to platelet clumping is also a diagnostic consideration. For discussion of ITP in pregnancy, see Immune Thrombocytopenia and Pregnancy. For patient education information, see the First Aid and Injuries Center, as well as Bruises. If bone marrow megakaryocytes cannot increase production and maintain a normal number of circulating platelets, thrombocytopenia and purpura develop. Impaired thrombopoiesis is attributed to failure of a compensatory increase in thrombopoietin and megakaryocyte apoptosis. In children, most cases of immune thrombocytopenic purpura (ITP) are acute, manifesting a few weeks after a viral illness. In adults, most cases of ITP are chronic, manifesting with an insidious onset, and occur in middle-aged women. These clinical presentations suggest that the triggering events may be different. However, in both children and adults, the cause of thrombocytopenia (destruction of antibody-coated platelets by mononuclear macrophages) appears to be similar. The spleen is the site of autoantibody production (white pulp); it is also the site of phagocytosis of autoantibody-coated platelets (red pulp). The slow passage of platelets through splenic sinusoids with a high local concentration of antibodies and Fc-gamma receptors on splenic macrophages lend to the uniqueness of the spleen as a site of platelet destruction. Low-affinity macrophage receptors, Fc gamma RIIA, and Fc gamma RIIIA bind immune-complexed IgG and are the key mediators of platelet clearance. The mononuclear macrophage system of the spleen is responsible for removing platelets in ITP, as demonstrated by the fact that splenectomy results in prompt restoration of normal platelet counts in most patients with ITP. Platelets are sequestered and destroyed by mononuclear macrophages, which are neither reticular nor endothelial in origin. Therefore, the former designation of reticuloendothelial system is considered imprecise. Immune destruction of immunoglobulin-coated platelets is mediated by macrophage IgG Fc (Fc gamma RI, Fc gamma RII, and Fc gamma RIII) and complement receptors (CR1, CR3). Treatment-related morbidity may result from the need to maintain the platelet count in a safe range in patients with chronic treatment-resistant ITP. These patients may require a long-term course of corticosteroids, other immunosuppressive medications, or splenectomy, and thus may experience the complications of therapy with corticosteroids or splenectomy. Children may develop ITP at any age, but the incidence peaks in children aged 1-6 years. Adults may be affected at any age, but most cases are diagnosed in women aged 30-40 years. Prognosis varies in children and adults. More than 80% of children with untreated immune thrombocytopenic purpura (ITP) have a spontaneous recovery with completely normal platelet counts in 2-8 weeks. Fatal bleeding occurs in 0.9% upon initial presentation.